and generously sponsored by Lynch Creek Farm! 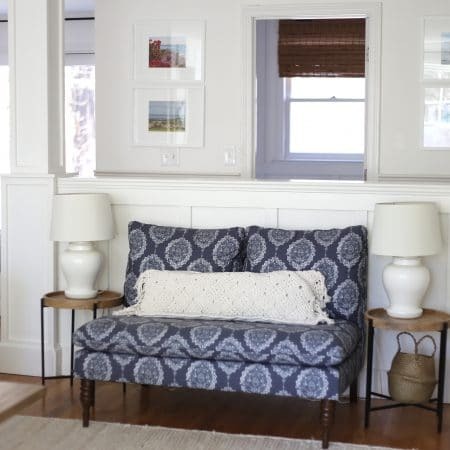 If you’re new here, I’m Lisa, mom to three teenagers, and lover of simple and meaningful decor. This year we hired a big project out and had our exterior painted white, with new black shutters, and I truly couldn’t wait for Christmas to arrive. This front door was just begging for some fresh greens! 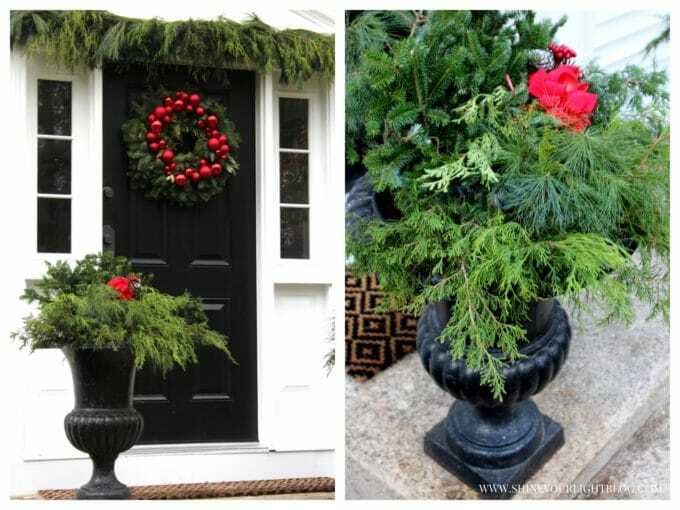 Lynch Creek Farm’s Red Elegance wreath is such a full, gorgeous wreath of noble fir, cedar, white pine, and even bay leaf tucked in there – I wish your computer screen was scratch-and-sniff so you could experience how amazing it smells! For the rest of my Christmas greens, I foraged my woods and gardens for clippings from our huge rhododendrons and the white pines that are all around us. We have two cedar trees that produce the prettiest blue berries and I love using cuttings from those too. Come on inside for a cup of Christmas cheer! As you’ll see I love the little details that make Christmastime so special and magical. 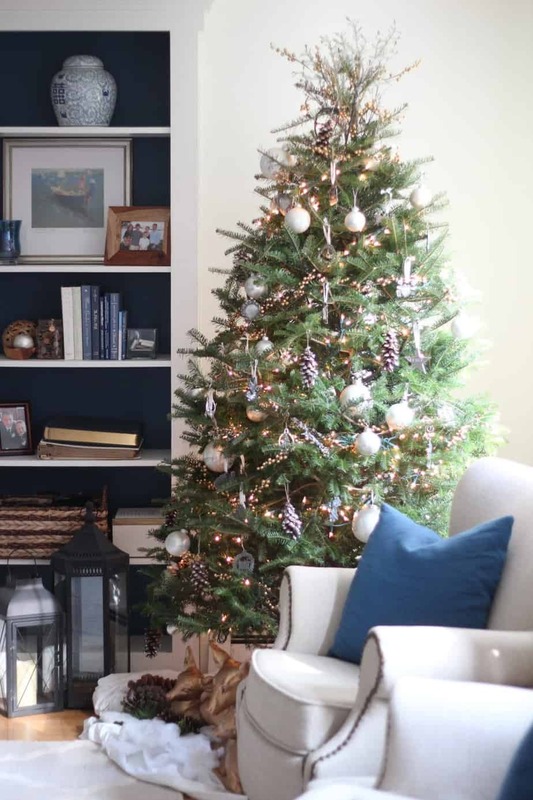 This year our family room tree has a unique inspiration! 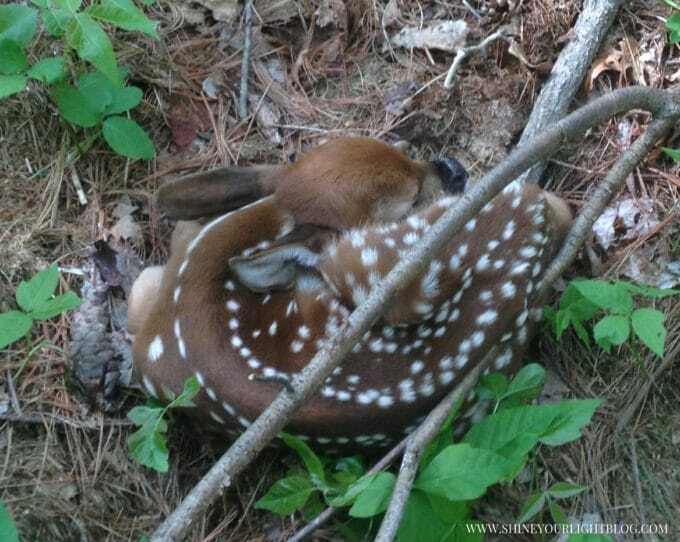 Two years ago on the day my mom was moving out of her house, we found this baby deer curled up in a bed of poison ivy, in the woods just feet from the backyard. The mother must have been fearfully watching nearby, and so we took a quick picture and left the sweet babe, but we’ve always marveled at how auspicious our discovery was that day! Fast forward to this fall when we were working in the yard. The former owners of our own house left us several garden ornaments that we always found a bit amusing. This little set has looked rather forlorn – I even listed it on our local Facebook yard sale site for free with no takers! 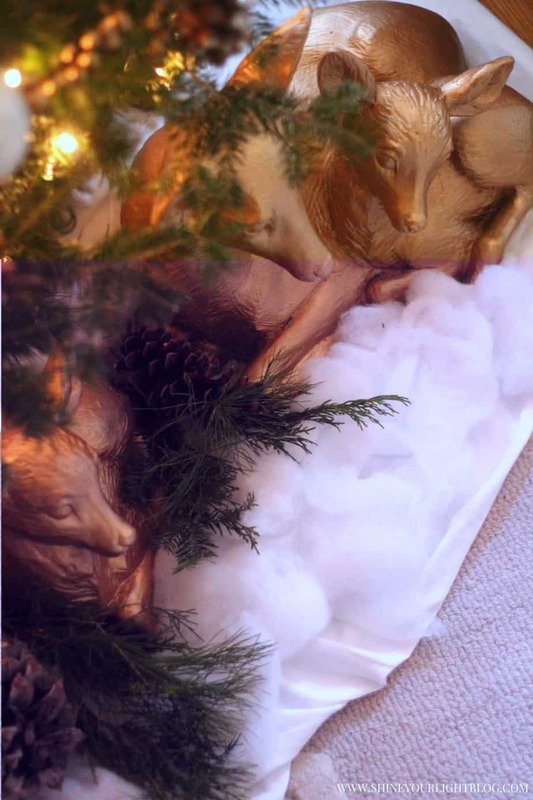 ….And then I thought of the baby deer in Mom’s woods, and how special that find was…….and the next thing you know this mama and babies found a snowy bed under the Christmas tree. 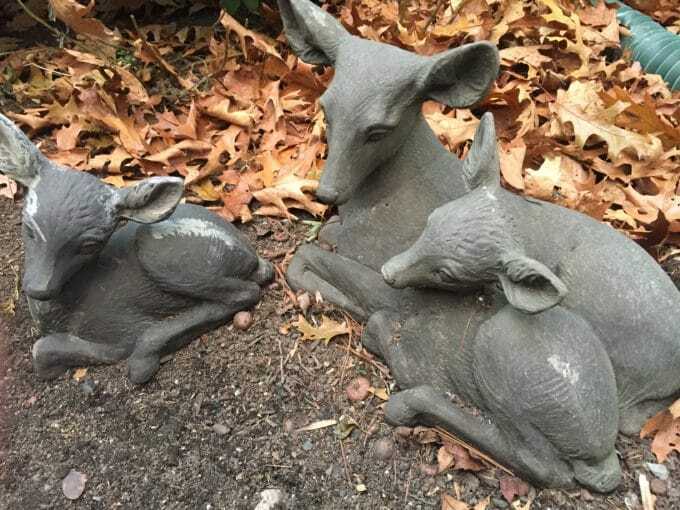 My kids were like – Mom’s reallllly lost it this time – she’s spray painting the lawn ornaments gold……. I love them so much! They are so peaceful and that is just what this world needs more of! Look how the Christmas tree lights make this chalet look like it’s illuminated from within! I didn’t even see this sweet detail until I was editing my photos. 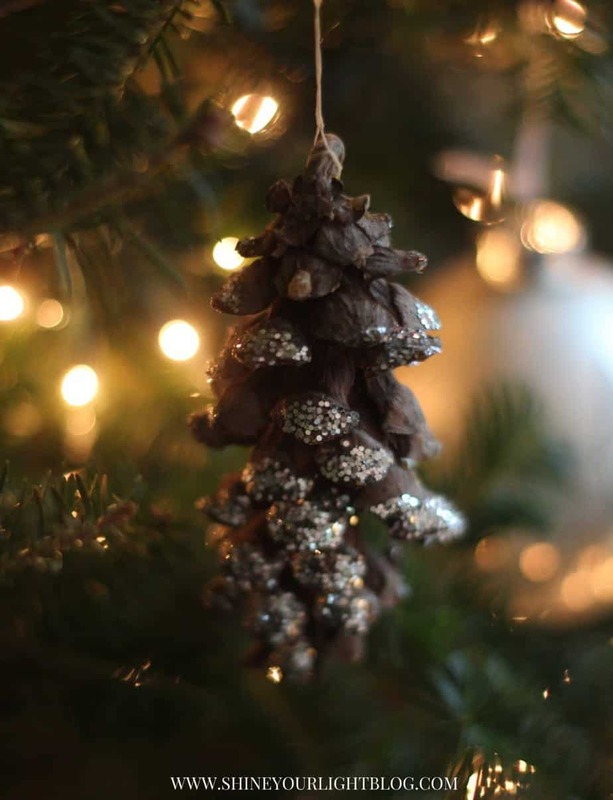 The glitter pine cone ornaments were a simple craft I did with my kids a few Christmases ago. What kid doesn’t love a craft involving glitter? And what mom does? ? I don’t always pull them out but this year they couldn’t be more perfect for a woodland tree! 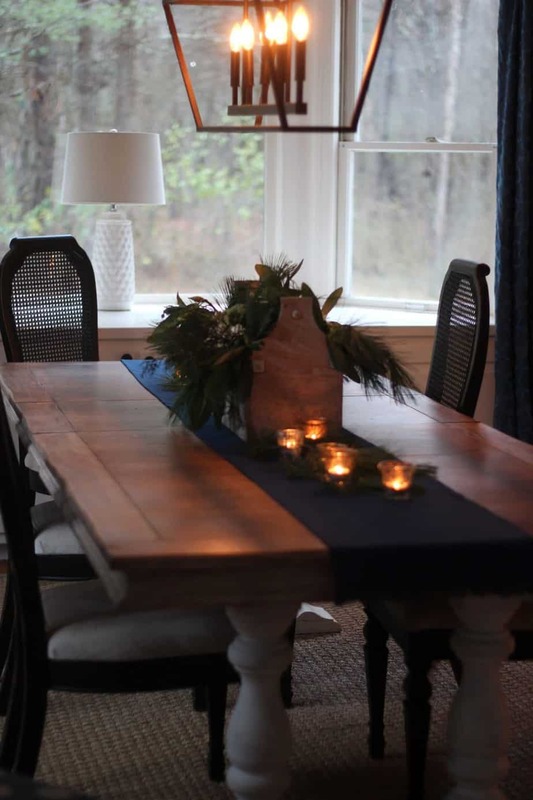 In our dining room, I wanted to keep the table simple but festive since we eat all our meals here and Mark and I also work at this table daily. Some of you may recognize this wooden toolbox, made by Uncle Arthur, Mark’s 99 year old great uncle who is beyond funny and makes everyone cry laughing with his stories! Uncle Arthur and his wife have been really special to Mark and his siblings throughout their lives. 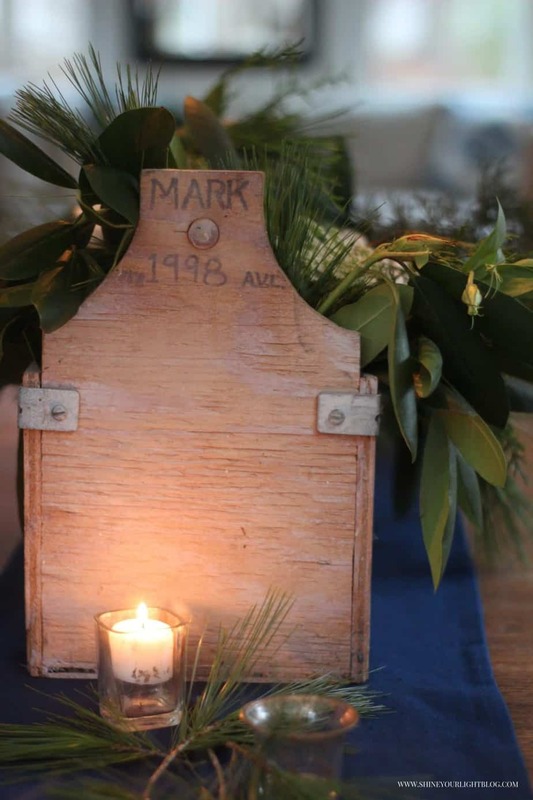 When we were first married, Uncle Arthur made this toolbox for Mark, complete with metal coffee cans filled with various sized screws, nails, bolts and nuts. Little did Uncle Arthur know it would become one of my favorite things! 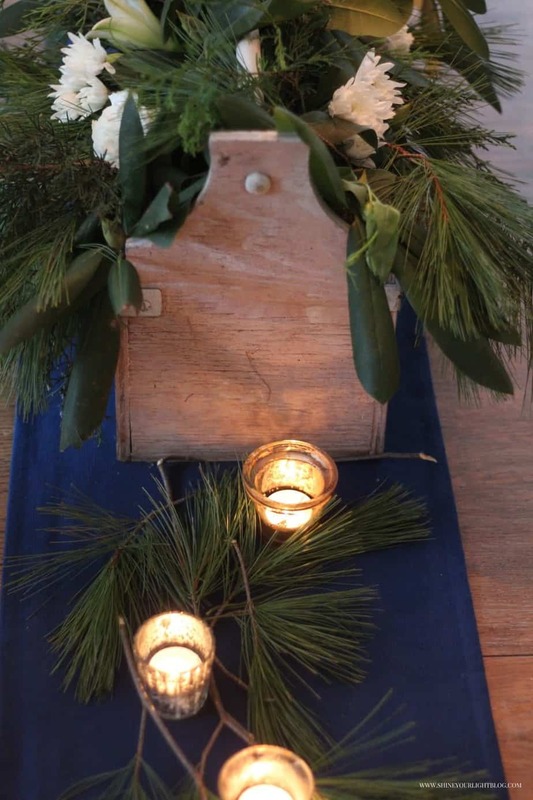 I use it to lug around small tools and supplies throughout the year, and come Christmas I always find a way to incorporate it into our decorating. It reminds us all of someone who has lived his life bringing humor, joy and kindness to others. 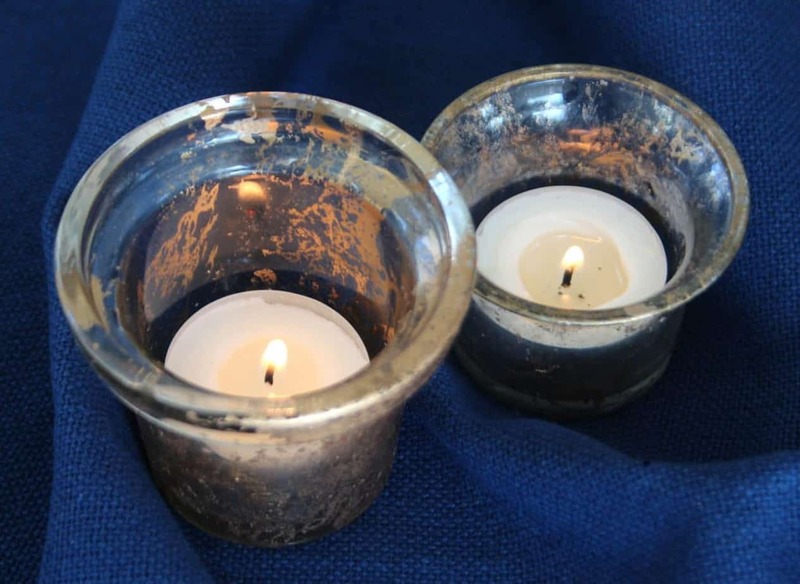 I love this time of day when candles glow and make the house feel cozy! 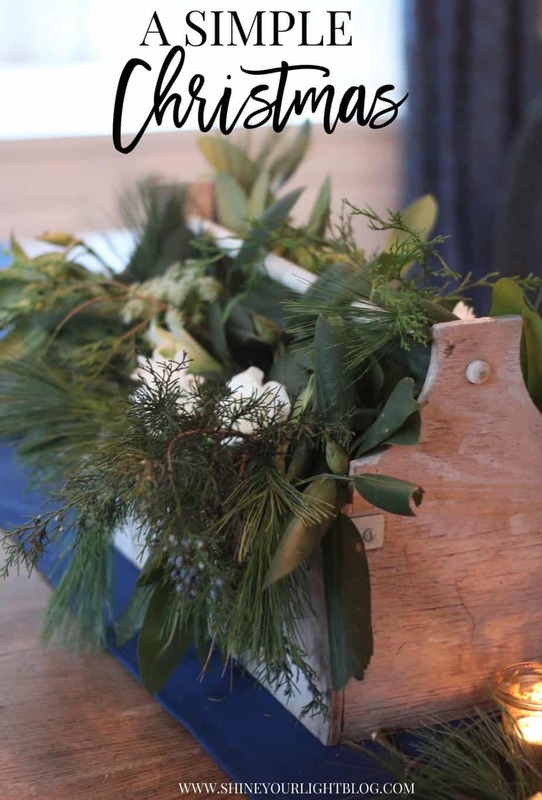 Now head over to Simple Details for some seriously inspiring holiday gorgeousness today!! Pam has the most beautiful way of styling her home with unique pieces and creative touches! Merry Christmas season my friends! you know you got me with the baby deer story! 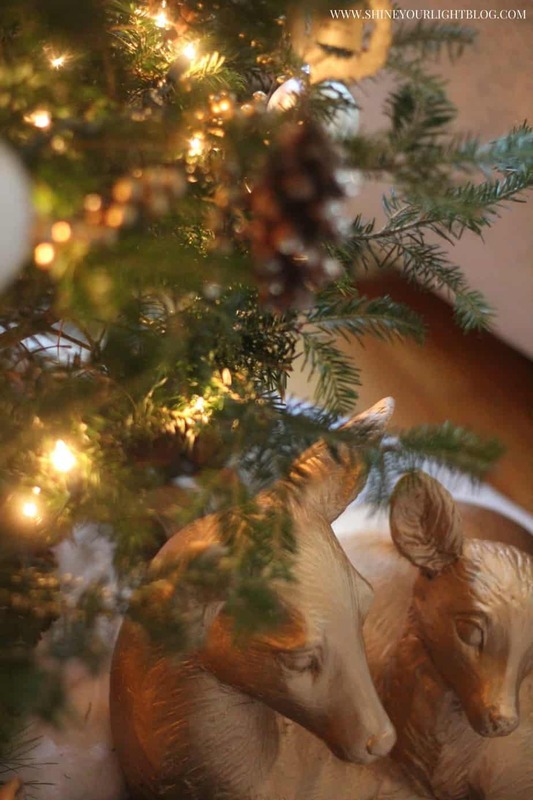 love it and just love how your deer look under the tree! Wow Lisa, absolutely beautiful! I’m glad you found a place for those precious deer, I would have scooped them up in a heartbeat and the toolbox, such wonderful memories. Thanks for sharing! Thanks so much Debbee, that toolbox was such a sweet gift, I hope someday my kids will use it too. Hope you enjoy the Christmas season, thank you for stopping by! Your home looks beautiful, so cozy and inviting. I love the precious deer you sprayed gold and put under your tree. What is wrong with the crazy people that did not take them for free. I would have jumped on that offer in a heartbeat. Aren’t you so glad no one did so you could use them as you have. It’s great to think out of the box. And the precious story of the tool box and how special it is to your family. So sweet of you to use it yearly in such a beautiful and special way. Debbie thank you for your kind comment! I’m a big softy about things like the wooden toolbox. I am SO glad right now that no one took me up on the free lawn ornaments! I think they will have permanent residence under our Christmas trees from now on! Thanks for stopping by…..wishing you a happy Christmas season! Oh my word! I never would have thought to salvage the deer like that! How beautiful! And that little fawn was precious!! 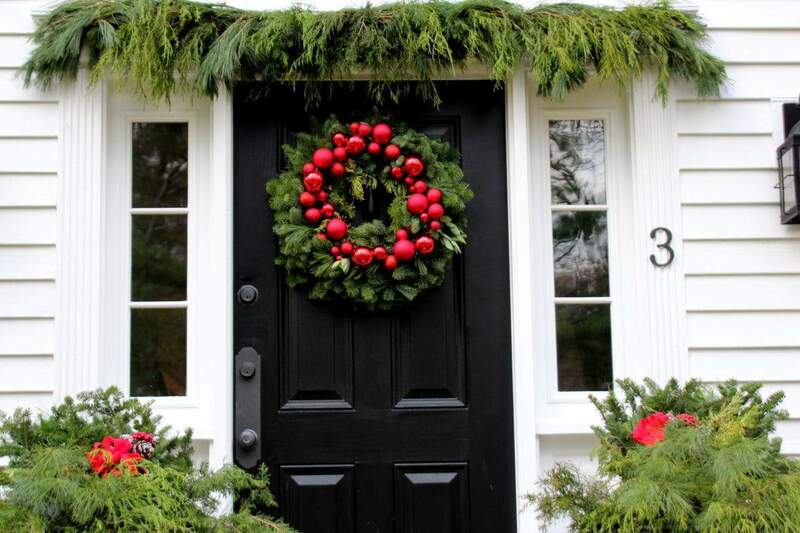 Your exterior looks especially pretty for the holidays! Just love it!! Heather thank you! You know the wonders of spray paint…..now I’m wondering what other lawn ornaments I can hit up next! Your decor is stunning and I adore how everything has special meaning. It’s extra special this time of the year. And that baby deer!!! Thanks lady!! I know, the baby deer was a MAJOR event in my family!! What is better than that!! So beautiful sweet Lisa! I cannot believe that sweet fawn that you were able to snap a picture. So special! You’re home and decor are just stunning and I always love your mix of thoughtful/sentimental touches. I wish we lived closer friend! Thank you for sharing with us! Merry Christmas! 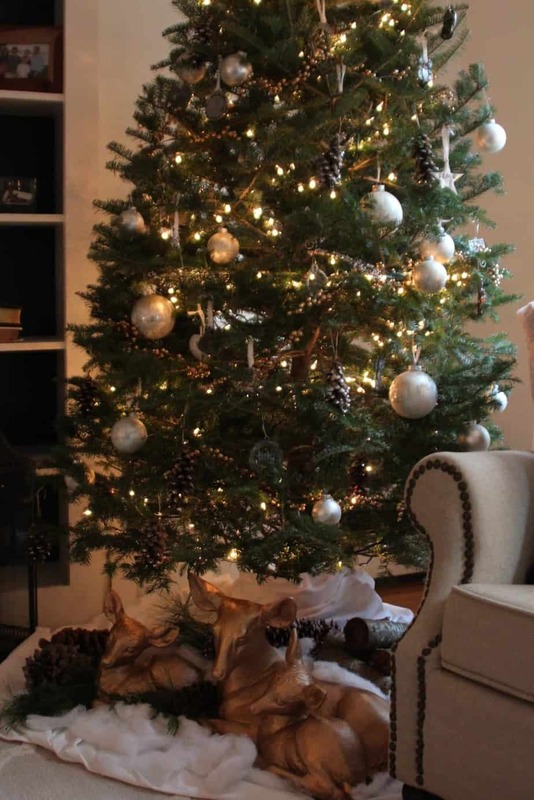 Lisa your house looks extra pretty this time of year, and I love your tree and how you decorated it! And the deer. Seriously, not only is that the cutest story, but I love that you thought to spray paint them! I would never have thought of it, and they look so cute there! I love that you painted the deer and brought them in! I’m sure my family would be saying the same about me but they are so perfect under the tree! Such a great idea? It was kind of wacky but I must admit I love them so much more under the tree than looking so neglected in our garden! Thanks Londen! Simple it is and oh-so-beautiful too my dear! 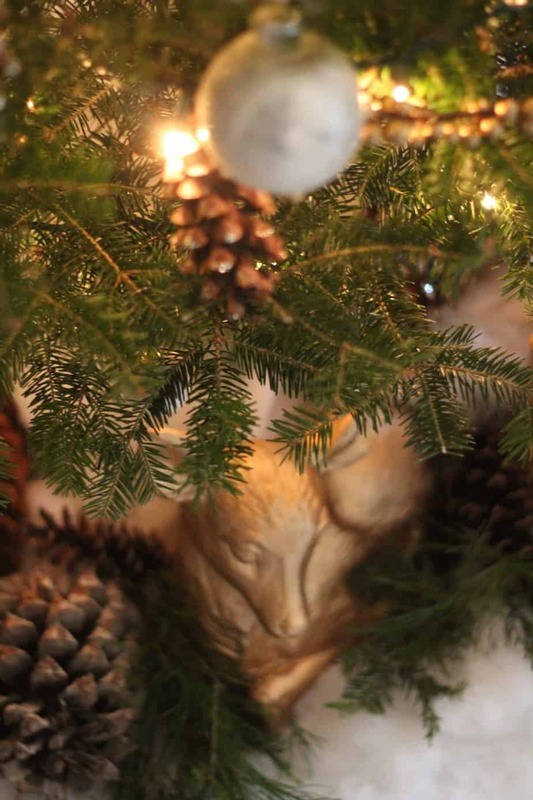 I love the deer story and how you made it part of your Christmas decor, it’s just meant to be! 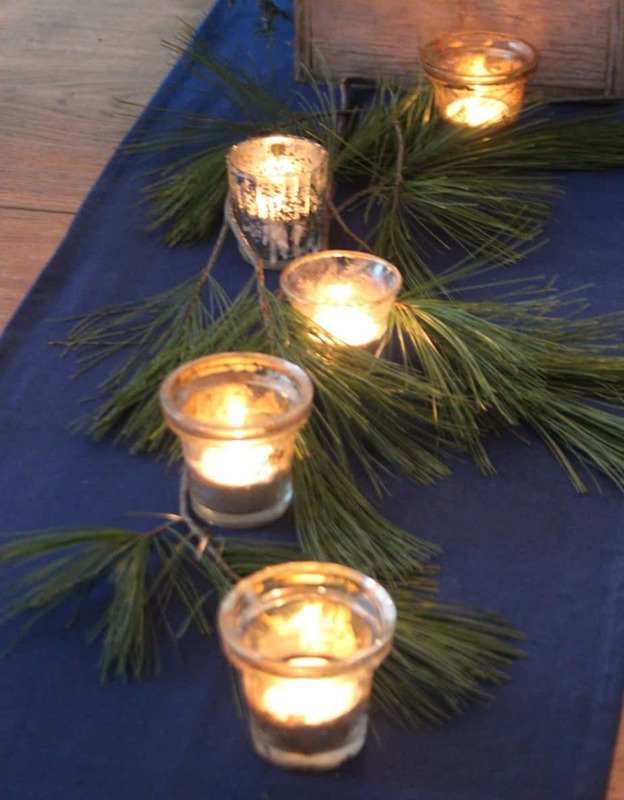 I love the pinecone ornaments and the simple table decor! I wish I can do ‘simple’ like YOU DO! I just go overboard with everything! LOL! So happy to share this home tour with you my dear! We’re yin and yang Vel! And I love how you do Christmas and all the holidays actually!! I used to do so much more decorating, but this house has fairly small rooms and it just feels right to go a bit simpler here. 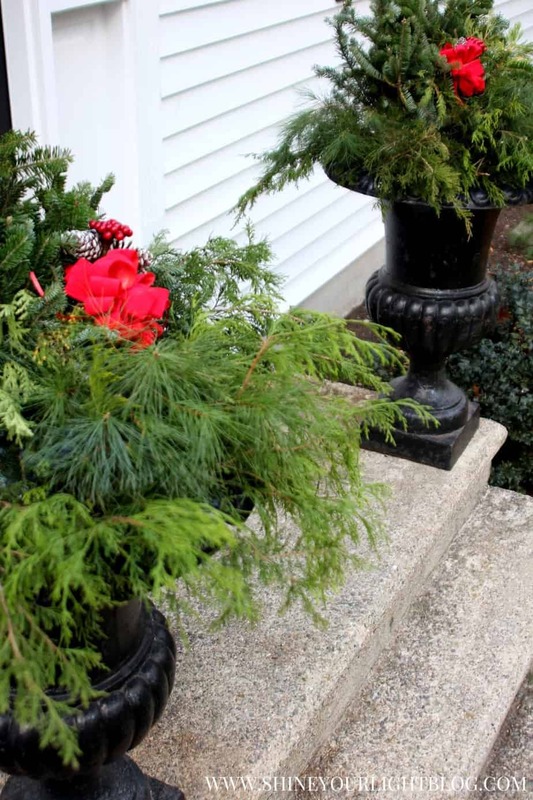 Okay…your front porch puts mine to shame…will you come and fluff mine up?! No one uses our front door so it is really hard to get inspired. Your front porch makes me want to give mine a little interest. 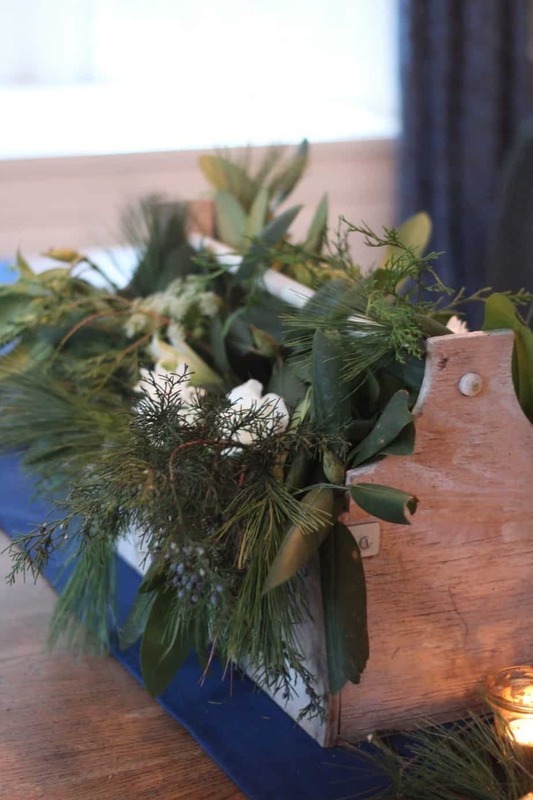 I love your simple decor…the same route I went this year…less is more!! Your house always looks lovely Lisa!! Thank you Cindy! I have gone a little more simple every year I think! 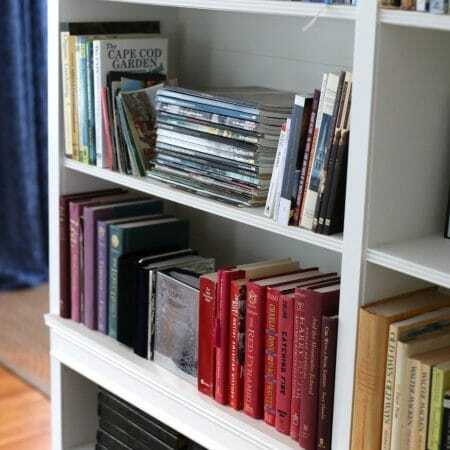 Your home always looks amazing and I love seeing what you do! Jen thank you! And that’s so funny that you mention that about your 5-10 year plan because just yesterday I was talking to our “tree guy” who trims back our outdoor trees and shrubs about what to plant so I will have more of a bounty come Christmastime!! He recommended hemlock, and we already have cypress and cedar which I absolutely love for cuttings! Loved taking your beautiful tour, you have so many inspiring ideas and designs. Thank you for stopping by here too! 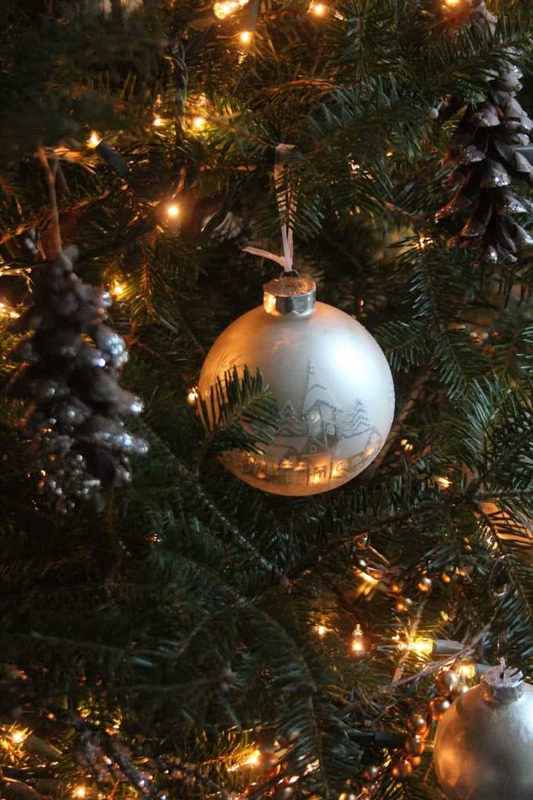 So very beautiful from your gorgeous front door to the gorgeous tree! Loved seeing the photo of the deer…oh no poison ivy? Such a very sweet photo….I live in an area where the deer are a part of the neighborhood…they can be pesky in eating everything in sight, but there is nothing like seeing a precious baby deer! Such a pleasure touring with you this week…Merry Christmas!! Shirley we have deer in our yard frequently too, and have a love/hate relationship with them. Love to see them, they are so graceful and beautiful, but not such a big fan of them eating our shrubs!! Still I can’t help but love them and it never gets old to see them in our backyard. So excited to be on this tour with you and am looking forward to seeing your Christmas home!! Thanks so much for visiting! 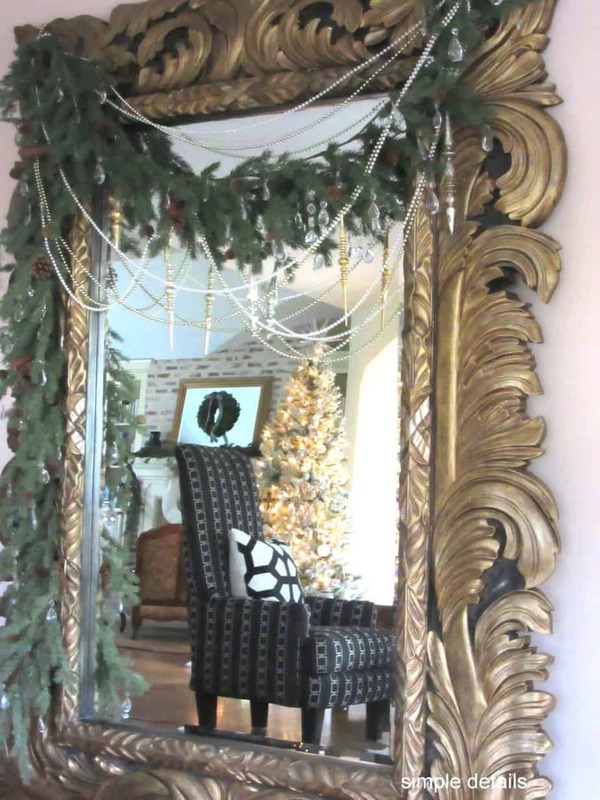 Lisa, your home is so beautifully decorated for Christmas! The greenery, the tree the adorable deer you spray painted! Great job! Amanda thank you so much! I am really enjoying going very simple this year! 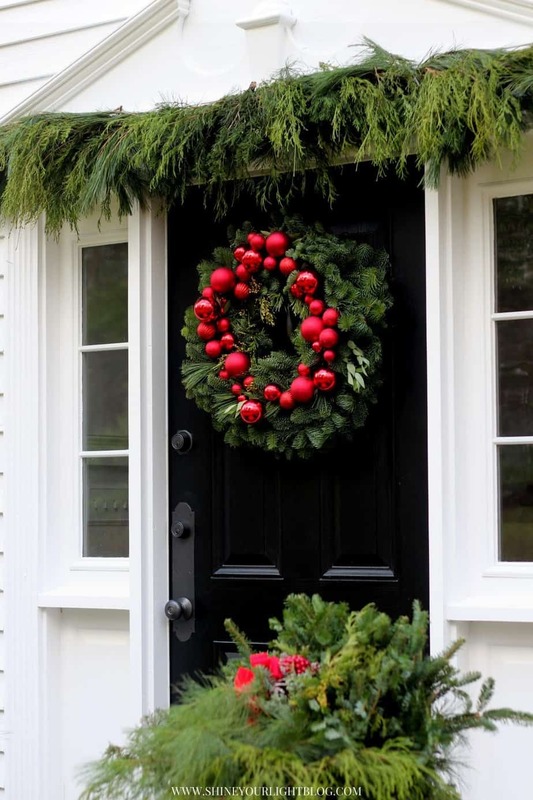 Lisa I just love that pop of red on your front door and porch! 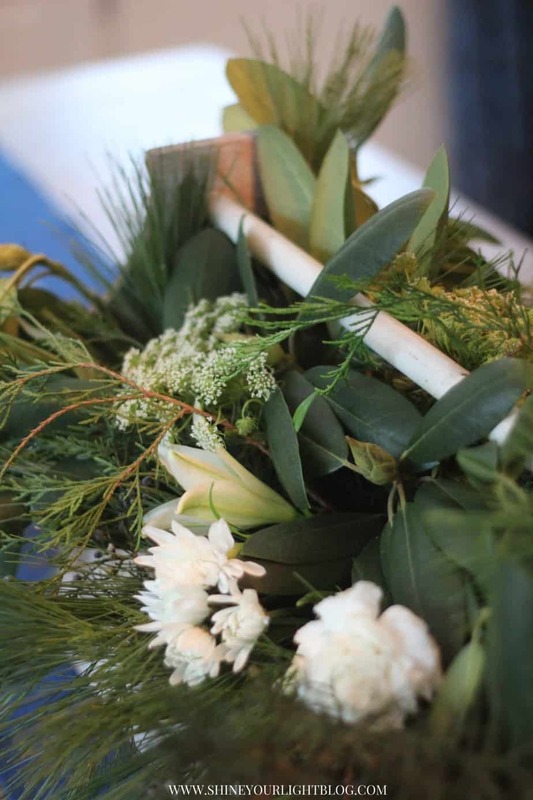 And all of your greenery inside is gorgeous too! What a beautiful Christmas home you have! Merry Christmas!! Thank you so much Tamara! I do love fresh greens and we are lucky to have a lot of evergreens around us! I love the story of how the deer came to be u under your tree. And to think you tried to give them away, And the tool box! I love how you use it and the memories it holds! Thank you so much Annie! 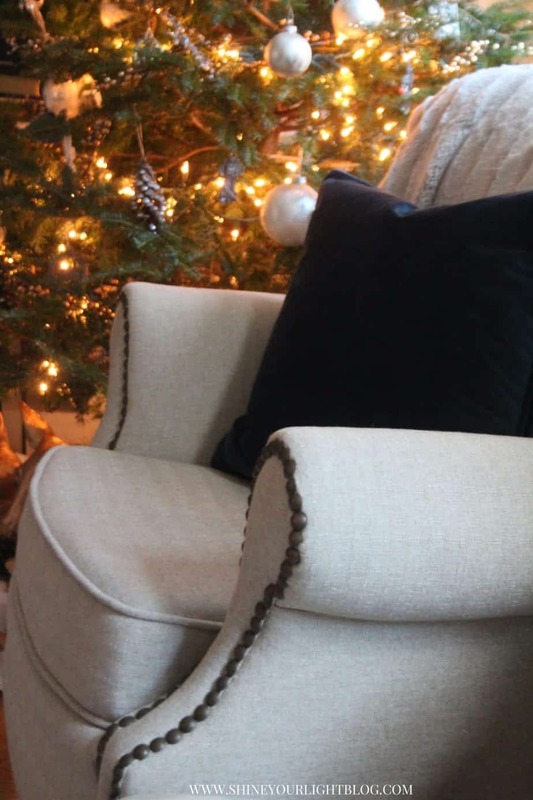 I have really enjoyed pairing down our Christmas decor these last few years as our kids have gotten older and using the things I really love! Everything looks beautiful Lisa! Love all the special, meaningful decorations you have. So sweet! Merry Christmas to you and your family.